My father, Rabbi Shabsi Katz, was born in Lithuania to a Chabad family. When he was a small child, he came with his parents to Johannesburg, South Africa, where he was educated until he reached yeshivah age – at that point he went to London to attend Jews’ College (now called London School of Jewish Studies) where he eventually obtained his rabbinic ordination. When he returned to South Africa, he married my mother and took up a position as the rabbi of Pretoria, the capital city. This was in 1954. And that is where he stayed until he passed away in 1991. Because of his Chabad background – though he was educated as an English rabbi – he developed a friendship with the late Rabbi Yosef Wineberg, the famous Chabad “globetrotting rabbi,” who persuaded him that he should meet the Rebbe. Once he did so, he became strongly connected to the Rebbe and made many trips to New York to seek the Rebbe’s advice on apartheid, his role regarding that issue, and many other issues. At his first audience he was accompanied by my mother, and I recall both of them speaking about that experience many times. Uppermost in my father’s mind was concern about the future as South Africa was in the throes of unrest then, and he wanted to know if perhaps our family should leave. He spoke favorably of Helen Susman, the feisty Jewish member of the South African parliament who had challenged apartheid, quoting some of her speeches and saying that we should be proud of the fact that we are represented in that way because that is the Jewish way. My parents were absolutely stunned that he knew so much about South Africa and its politics. That is how that audience ended. “Out of conviction and with love?” the Rebbe asked. “Yes,” my father again replied. As for me, I began to pursue a law degree but, with the Rebbe’s support, my father encouraged me to transfer to yeshivah. And, after receiving my rabbinic ordination and getting married, I returned to South Africa as a Chabad emissary in Johannesburg. Although I never had a personal audience with the Rebbe, I communicated with him frequently by letter, and he also influenced my life profoundly. The most dramatic story I have to tell concerns the blessing the Rebbe gave my wife when she was at death’s door. In 1987, shortly before Rosh Hashanah, my wife – Messody – had given birth to our third child, and about a week later she began to experience complications. She was hemorrhaging and had to be rushed to the hospital, where she was pronounced in critical condition. As I learned later, the doctors didn’t think she was going to make it. Dr. Rodney Unterslak , our family doctor, was there and he said to me, “You should call the Rebbe. Call and get a blessing right now!” He knew how dire things were although I still didn’t. I tried calling but could not get through. Fortunately, the head of the Chabad House at the time – Rabbi Yossi Hecht – was able to reach his father, Rabbi J.J. Hecht, who had a very close relationship with the Rebbe. Rabbi J.J. Hecht caught the Rebbe as he was leaving to pray at the Ohel, the gravesite of the Previous Rebbe. Immediately, the Rebbe gave his blessing for “complete and speedy recovery.” Meanwhile, I was sitting and waiting, reciting Psalms. A short while later, the surgeon came out of the operating room, still wearing his scrubs and mask. I waited with apprehension to hear what he would say. I started laughing and crying all at the same time – I was in such a state. As it turned out, just when the Rebbe pronounced his blessing is when my wife experienced a dramatic reversal of her condition. And, thank G-d, she recovered completely and went on to have more children. But there is a fascinating postscript to this story. My father answered that she was doing better, but he expressed surprise that Rabbi Wineberg knew she had been ill. When I heard that I was astonished. With all that the Rebbe had on his mind, he thought to place a call to find out how a woman in South Africa was doing! To me, that was absolutely incredible. 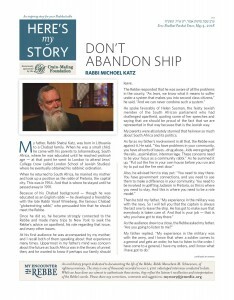 Rabbi Michoel Katz serves as the Chabad emissary in Johannesburg, South Africa. He was interviewed in August of 2014.